M.A. Lee writes romantic suspense and historical murder mysteries. 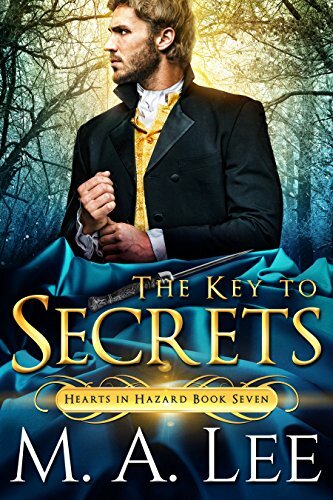 Her Hearts in Hazard series is set in the Regency era of Great Britain. Today her protagonist, Constable Hector Evans, shares with us a letter he wrote to the London Magistrate regarding a case he’s working on. Learn more about M.A. and her books at her website. I write to report a series of three murders, with the same modus operandi and a curious lack of evidence and witnesses. My current theory of the murder is that debutantes should snare fiancés, not murder them. That wasn’t my first theory of the crime when Lord Chalmsley reported the murder of one of his guests. I expected a shooting disguised as a hunting accident. But William Kennington, a young man in good health, died in his bed. Nor was that my first thought when we found another guest with his blood staining the sheets and soaking into the mattress. Barrington Pierpont died in the same manner as had Kennington. Now we have found Edmund Tretheway killed in the same manner. And the little bit of evidence that I do have points to one of the women, either a guest or a member of the family. The three men have in common that all were recently betrothed, two of them to young ladies associated with Chalmsley Court. And one of those ladies is Bee Seddars, the woman I love. As you know, sir, Chalmsley Court is the typical English manor of a typical English peer. Lord Chalmsley keeps as tight a finger on the estate as he does on his family. While the Court does not often host parties, people are eager to visit, and the house has several families as guests in celebration of recent engagements. The expansive gardens and well-run stables are known throughout the district. Servants rush to perform the family’s bidding. The house even has a mad woman in the attic, Mad Aunt Beth as she is known, an aunt of Lady Chalmsley who has lived on the fringes of the family for years. I know all this because I spent my formative years at the great house. I can still walk the garden paths with my eyes shut. I know without thinking the number of minutes needed to walk to the stables and kennels far beyond the kitchen garden. The house rises above a meandering river. Every time I see it I remember the hours that I dallied with Beatrice Seddars—until his lordship sent me to London to work with you and your Bow Street Runners, chasing criminals on London’s sooty streets. When I arrived here at the Court to investigate the murder, I thought I knew all the secrets of the house. I have discovered that I do not know any of the recent secrets. Mad Aunt Beth with her riddling snippets of ballads hints at recent troubles. And Lord Chalmsley doesn’t accept that I can find no murder weapon or no evidence and that I have too many suspects to solve this case quickly. Sir, I must admit that one of my chief problems with the suspects is that one of them is Bee. I still love her, and I doubt my objectivity around her. The third man dead was Bee’s fiancé, and she is a little too cool about his death. I remind myself that she admitted she did not love him. I worry that her coolness is because she murdered him. Who had a reason to kill all three men? To find that answer I will need a key to the secrets of Chalmsley Court. I admit that I want to trust what Bee tells me. Yet she could be diverting my attention from her guilt. What do Mad Aunt Beth’s clues mean? Is she helping me, or is she just insane? Who had a reason to kill three men? The evidence is here, sir. I must find it. When I do so, you may trust that I will see the culprit gaoled. Nor matter who she is. Debutantes should snare fiancés, not murder them. When Constable Hector Evans returns to Chalmsley Court, he doesn’t expect the violent crime to be the murder of one of Lord Chalmsley’s guests. His lordship wants a quick resolution, before gossip about the crime’s salacious nature and trap-like killing becomes widespread. With no murder weapon, no identifiable clues, and no eyewitnesses, Hector has little to build a case, but he has plenty of suspects, even when he realizes the murderer must be a woman.